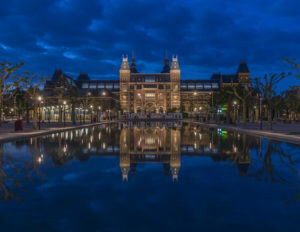 The 4D -Cultural Heritage Project takes advance of Imagery from the wild (Internet) and existing repositories to reconstruct 3D Models of Monuments, Places and Landscapes. This method however can not always reproduce a complete dataset of an object since the obliged views are depending on the prominent positions of the recording. We would like to present two different approaches to a work-flow which overcomes this issue through a semi – automated reconstruction as well as the use of simulation with a grammar based modelling. CalwTrailer1 from 7reasons Medien GmbH on Vimeo. The advent of technology in digital cameras and their incorporation into virtually any mobile device has led to an explosion of the number of photographs taken every day. Today, the number of photographs stored online and available freely has reached unprecedented levels. Advances in the fields of Photogrammetry and Computer Vision have led to significant breakthroughs such as the Structure from Motion algorithm which creates three-dimensional models of objects using their two-dimensional photographs. The existence of powerful and affordable computational machinery has now made possible not only the reconstruction of complex structures but also entire cities. 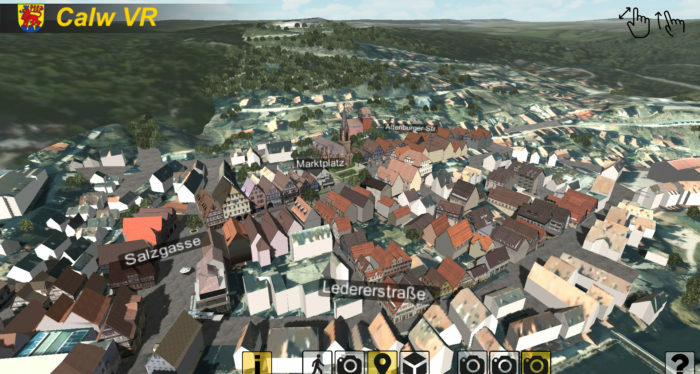 Within the 4DCH project, the city of Calw has been chosen as a test site for 3D reconstruction where different approaches were applied to model the central square of the settlement in different time settings (see Dieter Fritsch and Michael Klein, 2014). According to the project plan not only the central square of the town, but also the somewhat larger historical settlement core was modeled. 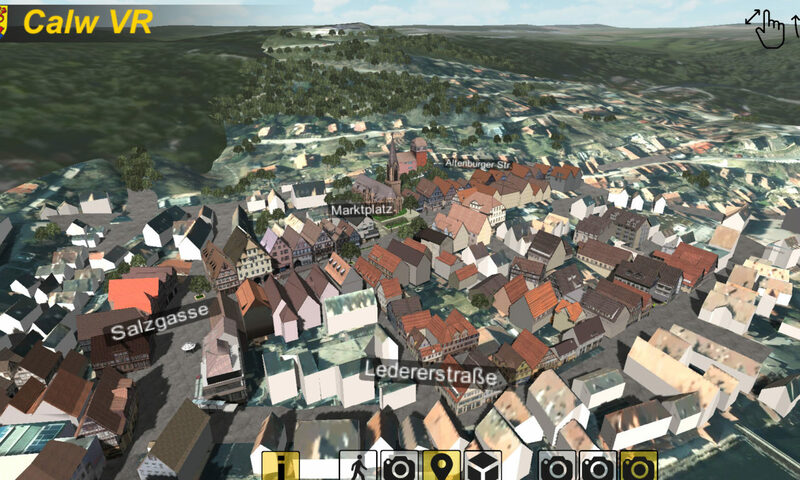 The results will soon be made accessible in an interactive virtual 3D realtime environment , powered by a game engine allowing the user to walk or fly -through the 3D model of the settlement and retrieve additional information on places and buildings on his demand. Further the switch into different time periods of the environment or a building will be possible depending on the accuracy and quantaty of the source material which is necessary to model out the complete set of structures. The modern digital breakthrough work done by Debevec, part of the Computer Vision Group at the computer science division of UC Berkeley, was the first research that raised interest in photogrammetry as a tool for architectural reconstruction from a single view source. Through the manual alignment of the vanishing points in an image its distortion and perspective can be used to calculate the position of the camera which collected it. Using the alignment of the camera the geometry can be adjusted to fit to the camera matched image in the background through orthogonal translations and extrusions respecting the coordinate system of the modelling environment, modelling out the features of the desired structure. In order to automate the process of image rectification one could also use the calculated camera positions generated by a SfM processing and therefore bypass the manual alignment of the vanishing points as described above, eliminating subjective factors in the rectification process. This however requires more than one view to allow for the the simultaneous image data processing in a bundle block adjustment. 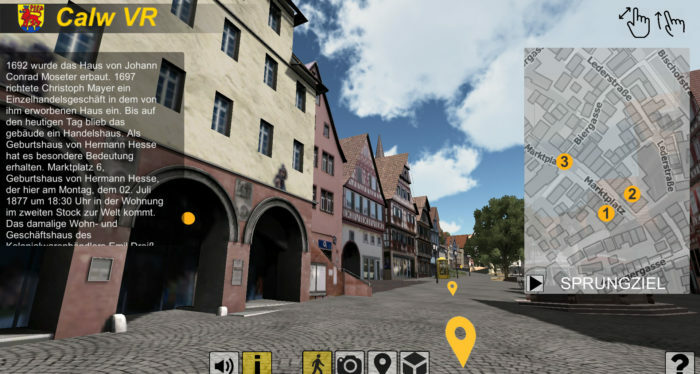 To illustrate this process we set up a test scene consisting a 3D model of the Hermann-Hesse Birthplace building, which was previously constructed through a manual camera match approach, from which several rendered images from different viewpoints were taken to provide a source for the SfM model generation. Any SfM sofware, such as VisualSfM, will deliver the camera positions, orientations and a sparse 3D model, which can be reimported to a 3D modelling program (eg. Autodesk 3ds Max). Inside the 3d modelling program one of the reconstructed camera views was chosen to verify the matching of the perspective with the background image, which served as a template for a newly constructed geometry, representing the outlines of the object (house). Since the constructed geometry, matched seamlessly with the vanishing points of the projected background image it can be confirmed that the camera match calculated from the SfM procedure is adequate for this purpose. The accuracy of the models generated through this procedure is highly dependent on the comprehension, skills and precision of the modeller in charge. Using this modelling technique historical images or even illustrations can be used to recreate a periodic morphology of the chosen monument in order to compare the changes occurring in this time range. Utilizing the manual approach of 4D modelling together with other automated modelling techniques like laser scanning, SfM and dense image matching in combination, will lead to an optimized model of a monument, which can be produced and delivered for dissemination. When published the mobile application will be made available freely and will additionally be available for VR Headsets. The aim is to complement the remaining building structures and develop past periods views which reach back even further than the 19th century. To due so, the participation of the citizens has to be motivated. Becker, S., 2011. Automatische Ableitung und Anwendung von Regeln für die Rekonstruktion von Fassaden aus heterogenen Sensordaten. Dissertation, Universität Stuttgart. ¹ Universität Stuttgart, Institut für Photogrammetrie . ² 7Reasons Medien GmbH, Austria.